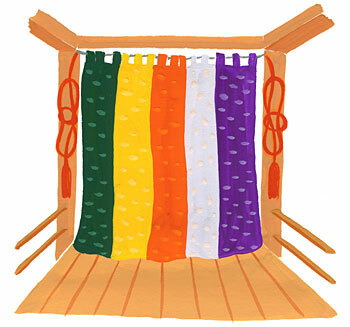 TRIVIA of Noh : Q16 : Why is the entrance curtain multicoloured? | Home | Trivia | Q16 : Why is the entrance curtain multicoloured? Why is the entrance curtain multicoloured? One of the dominant theories comes from the traditional Chinese philosophy of Wu Xing (the five elements). According to this, natural phenomena are classified into five elements: wood, fire, earth, metal, and water. They correspond, respectively, to five colours: green, red, yellow, white, and black. Black is equivalent to violet in the five colours of the curtain. It is common that things are arranged from right to left in Japan. When you see the entrance curtain from the gangway bridge, the colours are normally green, yellow, red, white, and violet from right to left. We still do not know why the positions of yellow and red are reversed from those in Wu Xing. In the National Noh Theatre, however, the order is the other way round and the colours are violet, white, red, yellow, and green from right to left when you see the curtain from the gangway bridge. It is because the order is arranged by the view from the Mirror Room where actors come out. There are two different points of view in the Noh theatre: one is from the auditorium, and the other is from the Mirror Room.